Gourmet donuts have become a new hot faze! Glazed Donut Bistro just opened in Los Angeles and I was invited to a private tasting before it opened to the public. The donuts were delicious. Glazed Donut Bistro make donuts fun. They have unique flavors such as Maple Bacon, PB&J, Smores, Cremesicle, and so much more. Check out my private tasting experience below! 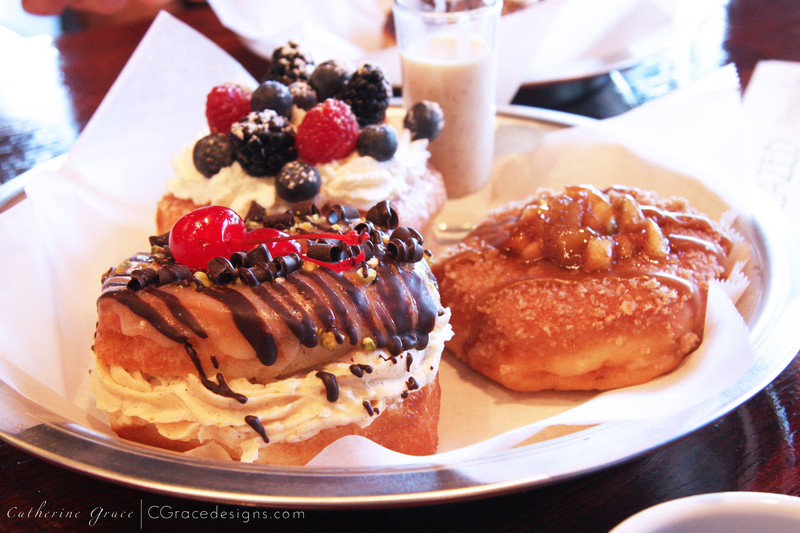 Tres Leches Donut, Apple Crumb Donut, & The Cannoli Donut . All were delicious. I loved the Tres Leches one (the one with the fruit on top). It was light and fluffy and felt semi-healthy because of the fruit 🙂 The Apple Crumb was topped with a cookie butter, caramel glaze & apple compote. It reminded me of the Holidays. Very festive! Smores Donut: Filled with house-made marshmellow fluff, chocolate ganache then topped with Graham Cracker streusel & bruleed marshmellow. MISSED PIGGY: Sliders piled high with tender pulled pork on delicately sweetened donut holes, served with pickled onion and a house-made bourbon BBQ dipping sauce. SHRIMP ROLL: Lightly dressed shrimp, gently enhanced with fresh tarragon & dill, and the crunch of fresh celery, onion and capers. Served on a house-made slightly sweetened Long John. This was yummy! This was a different take to a traditional lobster roll and it was well executed. It didn’t feel too heavy, but still had great flavor. Glazed Donut Bistro is great because it offers both sweet & savory. It’s comfort food made fun and it’s the perfect place to indulge.